As you can see, there are some tasks for writing the article, and they finish with the milestone which I called “Article done.” The duration for the milestone is 0 days. Each task, except the milestone, has an assigned resource. Now, before I start explaining when and why you should or shouldn’t have a resource assigned to a milestone, let’s take a look at what happens if I mark all tasks, except the milestone, 100% complete. As you can see if the milestone is not marked as completed, and all other tasks are, the summary task (in my case, the whole project) will only show as 99% finished. So, the milestone is 1%! As you know, when a resource is assigned to a task, it has some work effort. According to the magic formula, Work = Duration * Units. Typically, the purpose of a milestone is not to accomplish some work, but to close some phase (i.e. a set of tasks under the summary task) or to check if those tasks are really done. As you can see in the scenario above, we have two summary tasks, and three milestones, one for each phase, as well as one milestone for the whole project. I assigned a resources to each milestone. This does not harm the project plan, or the work effort. To conclude, you would likely not assign resources to milestones if all tasks in a set leading to the milestone complete the list. In this case, the milestone is automatically considered completed when all the tasks have been, so only thing to do is mark the milestone as 100% done. On the other hand, if a responsible person needs to approve all the tasks in a set once they have been completed, he/she should be assigned to that milestone. Both approaches are correct. The last thing to consider is if the milestone involves some work, in which case it should have a duration. When you have a duration linked to a milestone, cost will occur. In a “classic” milestone, with zero work and duration, there are no costs. Everything Mr Trajkovski says is true but it’s probably worth mentioning that in some industries (e.g. Aerospace and Defense) assigning a resource to a milestone would be considered a very poor practice and would result in the schedule being rejected by most clients. Also, to avoid the issue with the summary task over the real discrete work not going to 100% until the milestone is marked as complete, many schedulers move important milestones to a separate ‘milestones’ summary task. I think the Milestones should be placed were they belong in the plan (In the phase). Milestones are checkpoints and the Project manager reports the milestone plan to the Project owner by filtering duration on 0 duration. Is it correct to set up a separate milestone summary task – I think not! As for setting them up in a separate summary task – why? They are tied to dependencies in real work packages and that’s where they belong. I agree with the practice of starting and ending work packages with milestones – it does add lines to the schedule but gives a clear anchor point for predecessors and successors. 2) Make a resource called “LimitedEditor” with a Resource Calendar that’s set for vacation (out of the office) throughout September 2018. 4) The date doesn’t move – but they’re not available to work until October – they won’t be there to approve the milestone. If you assign time to them, and the Type is Fixed Work or Fixed Units, the milestone will move to their available date. Do you use fixed duration on milestones? Resources on milestones?? YES. of course. It is often used to indicate the accountable person/resource for a deliverable. So it is easily visible where accountability lays. For presenting milestone plans to customers you can always use flag fields to filter. Considering that the milestones are not tasks but points of completion of a group of tasks, these should not have assigned resources, but also depends on the styles that some organizations require, for example, some clients prefer that incorporates resource to the milestone to identify who is responsible for ensuring that the task group concludes satisfactorily. In my case, I do not usually allocate resources, because even if I assign them, they do not represent effort or cost because they have zero duration. Finally, the article has been interesting and useful for me to share with new collaborators who are integrating themselves into the PM role. Milestones are a special subset of a Task in that they contain zero effort and mark a change in state or transition. The meeting is either complete or it is not …. how much work/cost is consumed in a task with zero duration? Best scheduling practices, as noted in the DoD/Aerospace world forbid the practice of resources on milestones. Additionally, the Practice Standard for Scheduling (Published by the Project Management Institute) also says milestone resources are inappropriate. Sometimes people confuse the “Responsible Party” with the person doing the work (the resource) and assign a “responsible person” as opposed to a task resource. In my world (generally aerospace) the responsible party is a separate field. Yes, the software will allow it … that does not make it a god practice. I would suggest keeping “responsible party” as a separate field. Ah, but we do have another issue — “value” For example, payment milestones. I may be building a house and agree to provide a progress payment to the contactor of $25,000 when a specific milestone is closed to 100% (Milestones are either 0% or 100% … I can’t take 30% credit for something of zero duration — it either happened or it didn’t.) It would be other rules in the contract that allow for a partial payment. Occasionally, I do see people trying to claim “progress payments” and want to assign 30% to a milestone saying “Well, the foundation is 30% complete.” I believe the better way to handle that is based on the %Complete of an associated summary task. In doing so, we are conflating two different measures of %Complete. In Microsoft Project, the value for “%Complete” represents exactly one thing — duration. A 10 day task is 30% complete at the end of day 3. There is no other correct answer. 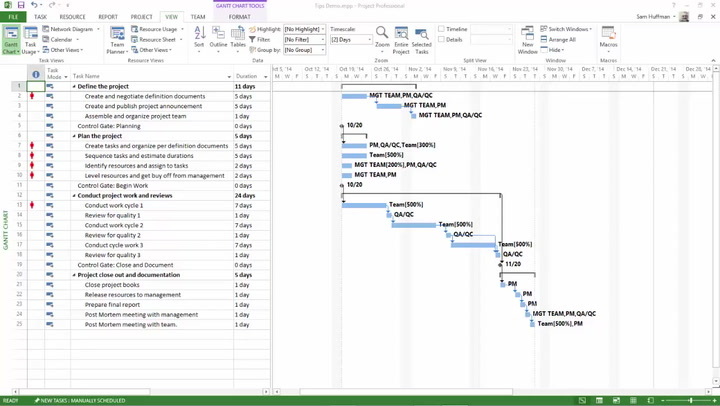 In the event the duration is 30% elapsed and the contract has 75% of the foundation poured and set, this represents the value of “Physical % Complete” (a different field in MS Project), Typically, we’d make a one day task of “Send Progress Payment to Contractor” of duration 1 day (or whatever) and then assign a Cost Resource of $25,000 to that task. I respect diverse points of view, please keep in mind that assigning dollar values or the like to a milestone produces unique behavior within the software and it may not roll up the way you expect. A charter or statement of work often specifies executive level milestones. Having a milestone at the end of the detail tasks under a summary is useful for reporting to a program or portfolio manager. To filter for exec level milestones, set milestone resources that include a useful preface, e.g. Ex-Design completed. Putting milestones at the top of a schedule for management to find easily causes a forest to dependency lines and can trip up a schedule when not manually marked 100% when appropriate. Better is to provide management a view that uses Group by “Milestones”.